Do you know where your shoes come from? Or that fancy leather jacket? There’s a good chance they’re from Pakistan because it’s the world’s biggest leather producer. Unfortunately, there’s nothing fancy about the labour conditions for leather workers in Pakistan. Workers often toil for long hours and low wages in deplorable conditions. They struggle with health issues because they work with toxic substances and unsafe heavy machinery, often without adequate protective equipment. 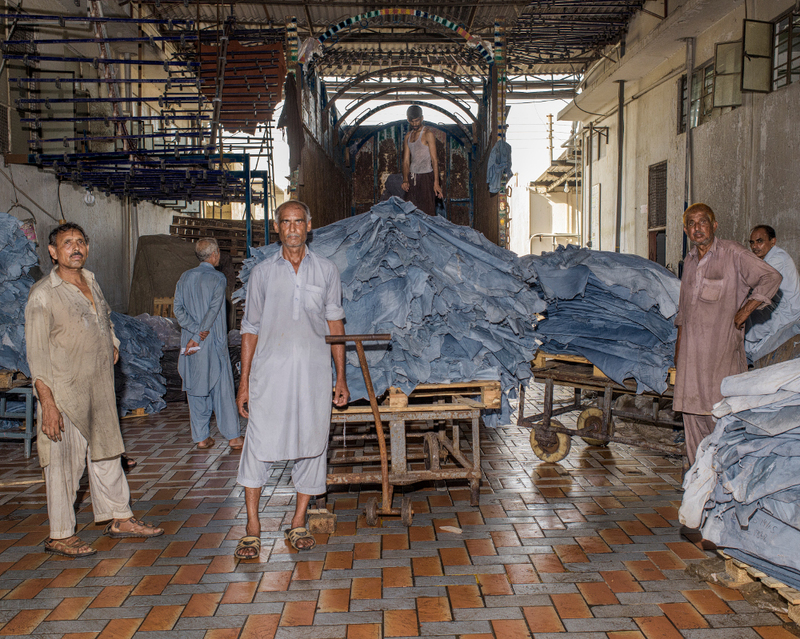 SOMO, NOWCommunities and Oxfam decided to carry out research into Pakistan’s leather industry. 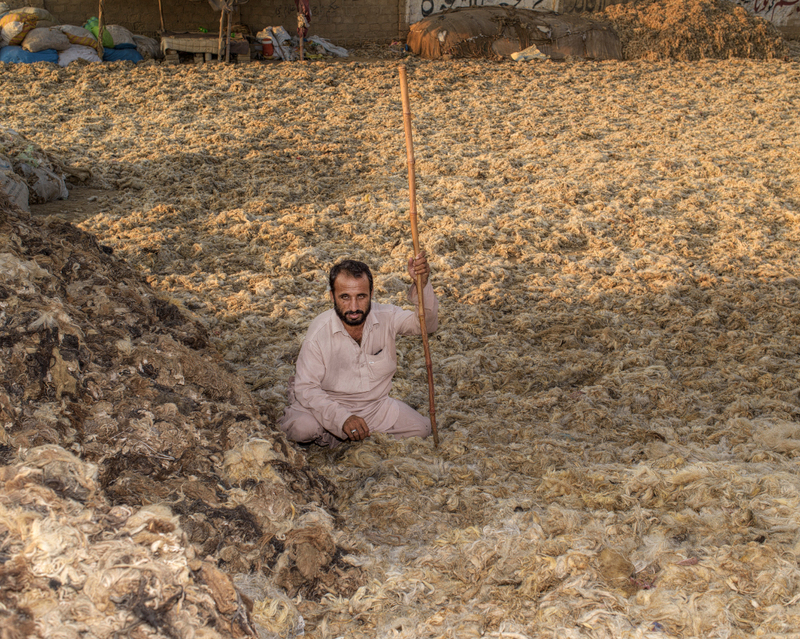 NOOR photographer Asim Rafiqui documented some of the working conditions in the tanneries of Karachi. You can read the story of the leathermen of Pakistan here. Pakistan produces around 4,500 tonnes of leather a year. Almost half of this leather ends up in Europe, much of it as manufactured products such as shoes, garments, suitcases and other accessories. Most Pakistani leather companies are based in Sialkot, Lahore and Karachi. There are many ‘integrated’ factories, where hides are tanned, dyed and processed into garments. The hides that are used come from cows, buffalo, goats and sheep. The animal hides are transformed into leather in the so-called ‘wet-blue’ process. Large wooden drums are filled with water and the chemical chromium, a salt compound from the metal chrome. These drums spin for a period of two to 24 hours. The workers often have no shoes or protective equipment in a very wet and extremely hot environment full of toxic chromium gases. This causes respiratory illnesses and nasty skin infections. 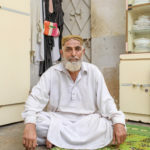 Muhammad suffered from acute kidney failure that started 14 years ago. At the time, he was working with a ‘hot-toggle’ machine in the tannery, in an extremely hot environment. He was suffering from constant dehydration because of it. He has been on dialysis to keep him alive ever since his kidneys failed. Meanwhile, he has continued to work in the same factory although he has been moved to a less strenuous workstation. He has not received any compensation for his illness, and has been forced to schedule his dialysis outside working hours. If his dialysis treatment interferes with his working hours, he says, his employer will dock his pay. When the hides come out of the drums, they are wet and blue, hence the name ‘wet-blue’. The hides are drained, rinsed and dried and, in some cases, stretched. Then they are prepared for the dying process. Before the hides are ‘shaved’ in a machine to even out the thickness. Our research revealed that these machines are insufficiently protected in one third of the companies. Interviewed workers told us that colleagues have lost their hands or arms working with these machines. Under Pakistani law, employers are obliged to provide protective equipment for people working with chromium. 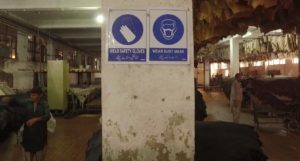 Through surveys and in-depth interviews with tannery workers in Karachi, it became clear that simple protective gear such as gloves and masks are often not being provided. Workers are also not aware of the need to use these, nor are they sufficiently trained to use the heavy machinery. Machines do not have proper safety protection measures in place and the stress to comply with production quotas leads to accidents where workers lose hands and arms. The hides are painted and oiled to lubricate the leather. The leather is then dried, which results in a tradeable, intermediate product called ‘crust leather’. A proportion of this crust leather is ready to be exported. The other leather will be processed in Pakistan and turned into end products. To turn the leather into garments, it goes through a process of ‘dry finishing’ in which the appearance and properties for end use are improved. This can involve the application of a surface coat, and mechanical processes like polishing, dedusting and flattening. As well as facing dangerous and unhealthy working conditions, workers often have trouble making ends meet. Their salaries are far below the cost of living: 14,000 Rupees (the legally allowed minimum) or less a month (€119). This is not enough to buy three meals a day, let alone to rent a house or feed a family. The Asia Floor Wage campaign, an international coalition of unions, calculates that the minimum monthly living wage in Pakistan for 2015 was 31,197 Rupees (€278.42). The inability to pay their rent, food and medical costs forces some of the factory workers to repeatedly take out loans with their employers. This only causes deeper problems. Sometimes workers have to ask their children to start working so the family can pay off their debts. The factories use a quota system where workers are paid their regular daily hours if they manage to meet their quota. However, the quotas are constantly set higher. Workers are now required to work longer hours and more quickly. They often work without taking any breaks to go to the bathroom or to drink water. A large proportion of the workers in the leather companies are not hired by the companies. In our research, we found that 95 per cent of workers are hired through labour contractors. This makes them very vulnerable. Often they do not have a legal contract binding them to the factory they work in. They are forced to work unpaid overtime. If they complain, they are sacked. If they join a union, before they know it they are moved to more difficult working stations. How can the European Union help? The European Union (EU) has made a special trade agreement with Pakistan (and some other developing countries) that provides trade tariff reductions (GSP+) on the condition that Pakistan implements core international conventions relating to human and labour rights. However, the EU doesn’t sufficiently check if these conditions are being met. There is a huge opportunity here to help Pakistan’s leather workers! The EU should urgently improve its monitoring. The Government of Pakistan should implement and enforce both existing national laws, as well as the international human and labour rights conventions it has ratified. Companies that source leather and leather products from Pakistan should conduct thorough supply chain due diligence to ensure that the leather they buy is produced in a responsible manner. They should take action to prevent or mitigate the violation of workers’ human rights when and where these are taking place. And what about you? You can help by sharing this story to raise awareness of the deplorable conditions for Pakistan’s leather workers.